Finally, no more wasted lotion, hair dye, acrylic paint, or toothpaste! That's because Big Squeeze Tube Squeezer makes it quick and easy to empty out nearly any tube. Take a closer look at how this durable squeezer can save you up to 20% more for your paints, cosmetics, medicines, adhesives and toothpaste. Most brands can only handle tubes that are up to 2 7/8 " wide. But what if your tubes are wider than that? Big Squeeze features a roller that can squeeze tubes up to 3 1/8 " wide. From small, kiddie-sized toothpaste to big, industrial adhesives, you only need Big Squeeze to get the job done. Easy To Use...Even Kids Can Do It. Put the tube between the rollers and turn the key. The gears will push the contents forward. Which means nothing will be left at the bottom. Its ergonomic design allows arthritis sufferers and small kids to squeeze content out of tough tubes like sunscreen or paints. Multi-Purpose Squeezer To Satisfy Your Needs...Perfect For Plastic And Metal Tubes. Use this squeezer to get the last drop from creams, gels, medicine, cosmetics, adhesives, and toothpaste without breaking a sweat ... or thumb! Big Squeeze has a 100% HASSLE-FREE Guarantee. If you're not convinced this ergonomic tube squeezer can save you time and money, call us within 30 days for a 100% refund. 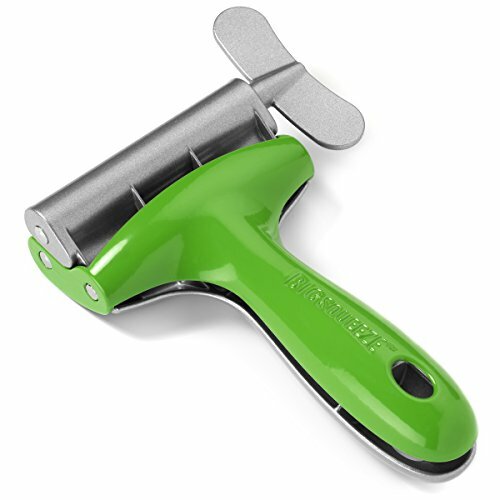 Get A Big Squeeze Tube Squeezer To Enjoy a Lifetime Of Zero Waste From Your Purchases. Click 'ADD TO CART' to BUY NOW! MORE THAN 10% WIDER THAN THE COMPETITION - Stronger and wider design means you'll save more money by getting more out of ALL YOUR TUBES: Toothpaste, Paint, Cosmetics, Sunscreen, Hair Dye, Adhesives, Metal Tubes. It's easy to waste product in metal and plastic tubes because these lotions and gels adhere to the inside walls of the tube. Big Squeeze easily eliminates waste by doing the hard work for you. People regularly throw away up to 20% but now you can save time and hundreds of $$ a year. HEAVY DUTY - Pinching and scraping expensive cosmetics, art paints, or even toothpaste tubes is aggravating because it wastes time and leaves up to 20% behind. Let the Big Squeeze do the work for you. All your moisturizers, hair products, and sunscreens are easily pushed forward ensuring you get every last bit. COMFORTABLE ERGONOMIC DESIGN - Big Squeeze easy hold handle eliminates discomfort unlike other tube wringers that are awkward to hold and can pinch your hand. The handles are intuitively designed to give you leverage when squeezing tough tubes like hair dye, art paints, adhesives, & caulk. Plus, the built-in tube diverter directs the tube past your hand. Other tube wringers send tubes right into your knuckles, OUCH! The large gap around the ergonomic handles ensures you'll never get pinched. SLEEK & STATE OF THE ART TOOL - We understand that the modern lifestyle has a different set of needs -- from aesthetics to functionality. At Big Squeeze, we believe in reducing waste to help the environment, saving time by not fighting with our tubes and ultimately saving money. That's why every Big Squeeze product isn't just a time and money saver...but looks good in your home, office, or workspace. LIFETIME WARRANTY - The Big Squeeze Tube Squeezer comes with a Lifetime Warranty. We take great pride in our products because they're Made in the USA! If anything goes wrong, we will replace it at no charge. That's our 100% HASSLE-FREE Guarantee. Buy with confidence - Order your Big Squeeze Tube Squeezer today! If you have any questions about this product by Big Squeeze, contact us by completing and submitting the form below. If you are looking for a specif part number, please include it with your message.